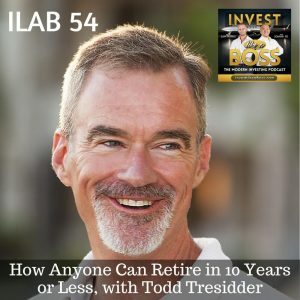 Todd Tresidder is a retired hedge fund manager turned money coach and financial blogger at Financialmentor.com. He became financially independent at age 35 through investing and is still an active investor who earns consistent investment returns in both up and down markets. Todd has successfully helped over 15,000 people jumpstart their financial freedom and plan for early retirement. During the show, we will explore strategies much different than the traditional methods taught by many other financial experts. Todd will share his thoughts on Robo-advisors like Vanguard and real estate crowdfunding. We’ll also discuss the unknown side of financial independence and the problems you may face once you’ve achieved success. Listen to ILAB 54 on iTunes here or subscribe on your favorite podcast app.